This is very exciting. We all know how much I love pony books, right? And some time ago now, I came across, via the Twittersphere, I think, a lovely lady called Jane Badger who has an online shop selling pony books. She has an interesting blog, too, and in fact I interviewed her for my Libro Small Business Chat series back in August 2012. Well, Jane has only gone and written a book about pony books! How could I resist that? You’re right: I couldn’t. In fact, I’m a bit late to the party, as the pre-order stock ran out. I know some of my friends have received and read it already! So this one will be promoted up the TBR pile – after all, it’s about pony books AND it’s by someone I know, so how can it not be? I can’t even resist that cover – so many lovely books! How many do I have myself? I’m not sure, but I know I’ll be poring over it and all the lovely illustrations forthwith. In fact, it was a bit difficult to resist sitting down and reading it as soon as it arrives, but I do have to earn the money that pays for these lovely books somehow … You can order the book from here, by the way. Acquired earlier but definitely second in the excitement stakes, we’ve got (a rather dark) Tony. Remember how I read that very funny book about Margaret Thatcher earlier this year (which I didn’t completely love but the bits I did like were excellent)? Well, this is by the same Leo Abse, Labour MP, and by that I mean old school, Old Labour MP, taking apart young Tony. I can’t remember when it was published (and I’m sorry, it’s on the TBR now and I’m a floor away from it up here in Libro Towers), and it does look like it came out early in his reign, but it will be all the more interesting if it was written while he was riding that wave of popularity. Expect some potty training and dodgy reasons for what he did and how he behaved, if the Thatcher book is anything to go by! 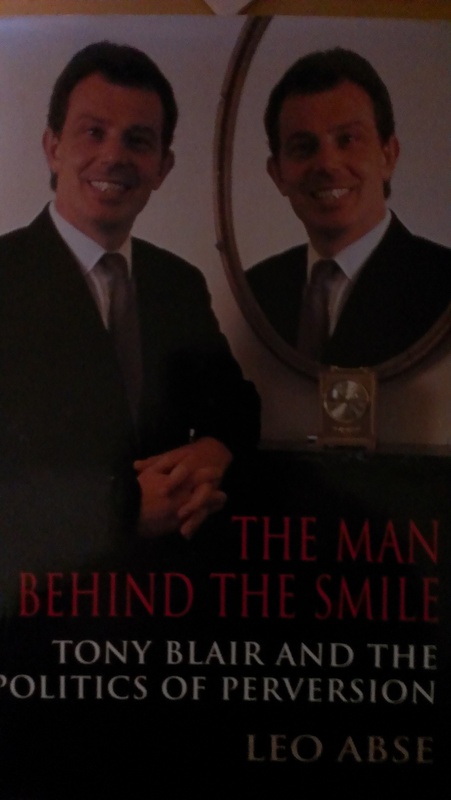 And of course, being part of my collection of Political Biography, it doesn’t count. M picked it up for me from a pile of books a colleague was discarding – good spot! Have you acquired anything new recently? Any confessions you’d care to share …? Today’s reviews are of books that are both by female authors whose books I have enjoyed for some time now. They’re very different, but I will always read any book published by these authors, and know that I will have a reliably interesting and absorbing read. Ruth Ozeki has written three books so far, and I am going to revisit one of them in my Month of Re-Reading in July. Cathy Kelly has written eleven, which pleases me, as I think I’ve only read about six of them. One of these is literary fiction and one is what would probably be described as “women’s fiction” – both are good reads in their different ways. I read this as my second readalong with Matthew, where he listened to the audio book and I caught up each evening with the paper book. In fact, because of some mild animal peril and slightly challenging themes, he did get further ahead of me than that and checked it was OK for me to read. It’s a good way to read a book, although it was a slower read than Capital, the first book we read in this way. Ruth lives with Oliver and their cat on a remote Canadian island. When a bag containing a diary written by Japanese schoolgirl, Nao, washes up on the beach, an entire community gets involved as different expertises and knowledge sets are needed to interpret the barnacles growing on the bag or the languages used in the texts within it. Is this the first detritus from the Japanese earthquake/tsunami starting to appear via the ocean currents? Were Nao and her family caught up in those events? Ruth feels a connection with Nao, and reads her diary to Oliver every evening (a nice echo of our reading process for this book). She tries to research the family and abandons her own writing, while Oliver tries to plant trees that the authorities say he’s no longer allowed to plant as part of an ecological artwork, and studies a new kind of crow that has appeared seemingly from across the ocean, too. Alternative sections of Nao’s diary and Ruth’s narrative, along with letters from Nao’s uncle, forced to become a fighter pilot in the Japanese Air Force in WW2 cover the personal, the philosophical and the historical, with forays into alternative worlds theory and Buddhist practice as well as Japanese popular culture. It’s an emotionally touching read in which you also learn a lot (like with all of Ozeki’s novels), although in this case it sometimes feels a little like the knowledge is there because Ozeki learnt it and wants to include it, rather than because it adds to the narrative or the background. I felt that the power of the ending was undermined rather by the metafiction and almost “cleverness” that prevailed in the latter sections of the book. This led to a slight but marked sense of disappointment – I would like the author to have resolved things in maybe a more natural way. But it’s still a powerful, affecting, curious and surprising read. Warning: the book contains some quite powerful scenes of violent and violating bullying at school and in the air force, an unexpected concentration on 9/11 and the Falling Man which may upset people, and some animal peril although this is not gratuitous and if you flick to the back of the book you can work out what happens there. Kelly is a favourite light author of mine, and very much the inheritor of the “Irish women’s fiction with humour and reality” mantle passed to her by Maeve Binchy and Marian Keyes. In this satsifying novel, a cross-section of people live or arrive in a Dublin square, from a spinster teacher with a much younger sister through a cafe manager with a heart of gold and a hidden sorrow, an elderly American woman mourning her husband and re-reading her mother’s recipe book, to a minor celebrity who’s committed an indiscretion and needs to hide at her aunt’s house for a while. They are all healed by love, patience, sensible advice and the odd scrap of romance. Satisfying, funny, heat-warming – an easy read but well written and expertly crafted: happy endings don’t always come and when they do they have to be earnt, and it’s a great read for the exercise bike or the wallowy bath. Sometimes you can’t get better than that. I’m currently reading an excellent biography of the diarist and recorder-of-matters-Bloomsbury, Frances Partridge, and a slightly indigestible PhD printed directly as a book on Iris Murdoch. What are you reading at the moment? Yesterday night I went to my first meeting of the Jewellery Quarter Bookwormers, which is run by a lovely chap, Simon Stokes, who’s gathered an impressive roster of writers local and not-so-local to visit the Drop Forge Pub in Birmingham’s Jewellery Quarter to talk about their work, take questions and sell some books. 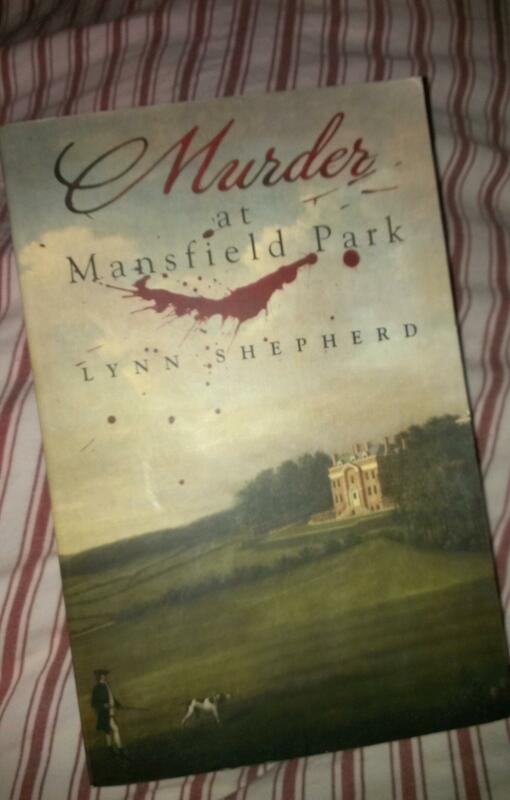 This month it was the turn of Lynn Shepherd, who has written three books which take a known work of literature (or, in the case of her latest book, a literary group) and twist it to introduce an element of mystery. Now, I’m not one for the crime or horror, but I was persuaded to go along, told which of the books I might like, and duly met up with friends and wandered across town to the Jewellery Quarter (it’s not that far, actually; I think it’s the barrier of the ring road, which isn’t much of a barrier as you just step across a crossing … but it’s a bit like Coventry: you know it’s there but you don’t venture there from Birmingham very often). I’m very glad I went. Getting there early, we had the opportunity to have a nice chat with Lynn beforehand. During this chat and her presentation, it became clear that she takes her research very seriously. She loves and knows the books she works with, and she obviously takes great pains to get things right, amassing, for example, a huge body of knowledge about the Shelley family along the way. While raising the spectre of Georgette Heyer isn’t always greeted with gladness and glee, I think the same applies to Shepherd as does to Heyer – their attention to detail and concern with getting it right lifts them above similar novels in the genre, be that reworkings of classic novels or Regency romances. Lynn is an inveterate story-teller, engaging us with her tales of her work, research and the Shelley family. Time passed quickly, and all too soon it was time for her to go back to Oxford. I was impressed enough to buy a copy of the book (to be read in August, I’ve decided, after re-reading Mansfield Park in July. You don’t have to have read the original to enjoy the new books, but it will add another layer, I’m sure, so it’s worth doing). As Lynn combines her writing career with a copywriting career (I drew some parallels between writing to order in that side of her job and writing about people she might not actively like in her creative work), I’m hoping to feature her in my Small Business Chat series on the Libro blog at some stage. The Drop Forge is a good venue for such events. It’s quiet on a Thursday evening and as well as the usual pub layout has one long table with seats around it, and The Snug, where we were, which has a long table and comfy chairs and would suit other such get togethers. There is music, but it’s not too loud and doesn’t disrupt the author’s talk. They do tea and coffee as well as the usual pub drinks, and food which looks good, if not really suitable for people trying to eat low fat, etc. (I’m not sure of the gluten-free offering but it’s worth checking). Well, today I was out doing random shopping and fell into that cheap chain of book-and-stationery stores on the High Street again and came out with these two. In my defence: I will buy anything by Hunter Davies, including the one on football. I have read and loved him since he used to write for Punch (and the Guardian?) way back when. And I do like a sports bio … and a running book ..l and a book about the Olympics, so the Seb Coe one fulfils all of those (I know he’s a Tory, too. I do read a few books by Tories. Haven’t converted me yet!). I am a bit worried about the amount of book buying that I’ve been doing recently, and I thought having to “confess” on this blog would make me pause … nope. I did get rid of 10 books, straight out of the house, this morning, as I read a horribly distressing thing I don’t want to go into in a volume of autobiography of a chap I’ve been collecting for years, and had to get rid of all of his books to the charity shop (let’s not discuss that anymore though, please, even though I’m usually begging for comments on my posts). 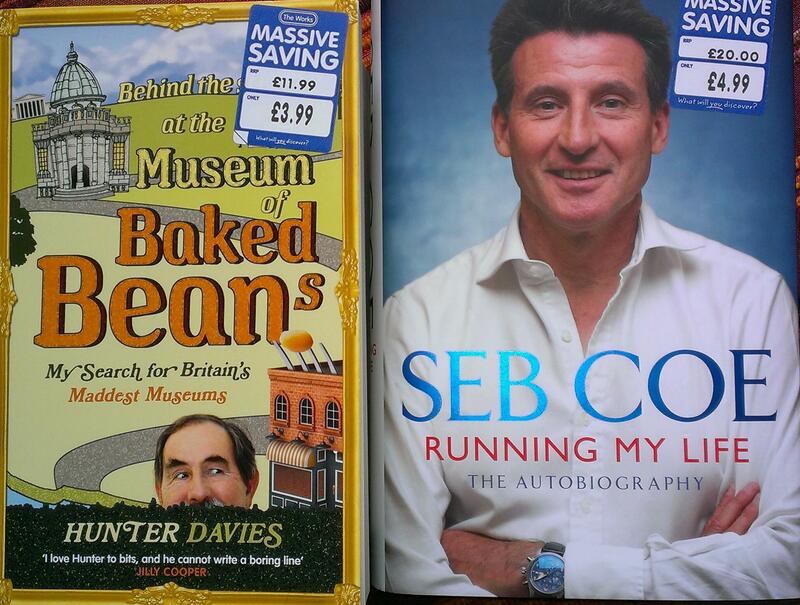 Both shop assistants: Who’s Seb Coe, then? Never heard of him. Me: What???? He like RAN THE OLYMPICS. And ran IN the Olympics in the 80s. He was one of our greatest middle-distance runners. I know I’m ancient, but surely … ??? He was all over the Olympic coverage. He brought them here and he organised them. Y’know … last year? Olympics? Boy shop assistant: I’m not really into the Olympics and that sort of thing. Girl shop assistant: He’s got really nice hair, anyway. I can’t really add anything to that, can I. Oh well. I’m hacking through Mt TBR quite briskly at the moment, although those two large volumes from the other day aren’t helping hugely, and I just moved my Great British Sewing Bee book upstairs, too (yes, I am going to read it, I didn’t just buy it to get it signed!). So I’ve got two novels to tell you about, both by writers whose books I’ve read many times before, and one a re-read. And yes, a small confession, too, but it really does NOT “count”, I promise. Read on to find out why (not)! This is the third in Smiley’s series featuring young Abby and the horses on her father’s farm. They’re interesting, because they’re as much about her friendships and family as they are about the horses, and they’ve also got a religious angle, in that her family belong to a very small church and at the moment she goes there too (I don’t know if this will change in subsequent volumes). They are quite big and satisfying books, with the plot moving along nicely in each one, and enough reference made to previous events that you can feel happy to be reading a series, but they do stand alone, too. In this instalment, Abby “buys” a beautiful grey horse whose mysterious owner has died suddenly. It’s nothing to do with the horse, but he’s left abandoned, with no one to pay his boarding fees and no one to claim ownership. So, Abby takes him on and is just starting to learn how he ticks when disaster strikes and she’s unable to ride. As if this isn’t enough, an incident at Church threatens to decimate the congregation, and Abby feels like she’s being blamed, and then some ghostly happenings start up, triggered or increased by the appearance of a small (and exquisitely described) kitten at the house. I’m not sure that the ghost bits worked that well. There was a twist, as you’d expect, but it didn’t really explain things at all, either in terms of explaining them away or in terms of what it’s all about if there is a ghost. That was the least satisfying bit of the book for me (but then I don’t like ghost stories much) although it was well woven in to the plot, with Abby’s friends sharing their own tales. But apart from that, it’s a good read, and I was pleased to see that books four and five will be along shortly. I wonder if pony books are as compelling to write as they are to read! I have to say straight off that this isn’t my favourite Pym novel. Sorry! I like the ones featuring anthropology and librarians, or mad offices, or both, best – so I enjoyed last month’s read, “Less Than Angels“, which some other people in the LibraryThing group that’s reading all of Pym this year weren’t so keen on. For this one, we’re almost in Elizabeth Taylor territory, with the heroine, Wilmet, one of those ladies who doesn’t really have quite enough to do, living with her husband and his mother in comfort, with old friends and the time to indulge in the odd crush and light flirtation. She’s a vulnerable and rounded character, but not a very identifiable-with one, and normally this doesn’t really bother me, but it leaves a sort of space in the heart of the novel. There are many of the usual Pym accoutrements, of course: female friendships, tolerated pink husbands, churches and church houses, timid mousy ladies and overbearing mothers. There are also satisfying references to previous books scattered liberally throughout the story, and in fact one character in particular rather intrudes (I won’t say more than that for fear of adding a spoiler). I didn’t have many postits out in the garden with me where I read much of this book, and had to split them into smaller and smaller shreds as I noted references to Rocky Napier from “Excellent Women”, Archdeacon Hoccleve from “Some Tame Gazelle, Julian and Winifred Malory from “Excellent Women” and Prudence from “Jane and Prudence”, and there’s a reference to one of Catherine from “Less Than Angels”‘ stories, and speculation as to her character, as well as others whose postits surely fell out in transit. In fact, this seemed to be my favourite bit of the book, although there were some delightfully waspish and eccentric chaps associated with the church who raised a chuckle or two, and Wilmet’s “disappointment” (hardly enough to be an “unpleasantness” is subtly and well done. In the end, nothing really happens, there are a few plot resolutions and Wilmet and Rodney will perhaps find themselves in a rather new situation. Maybe they’ll find themselves living next door to some anthropologists in a future book. Just because this isn’t my favourite Pym novel doesn’t mean it’s not a good novel – it’s wry, clever, witty, perceptive and atmospheric, of course. So, when someone connected with a new imprint that’s reviving out of print novels and offering them in print-on-demand and electronic versions contacts you because they’ve seen you discussing a particular author, and they offer you a choice of novels to have sent to you, and you choose the one that you don’t yet have and haven’t in fact read, but have promised to a group to read later in the year, that doesn’t “count”, right? 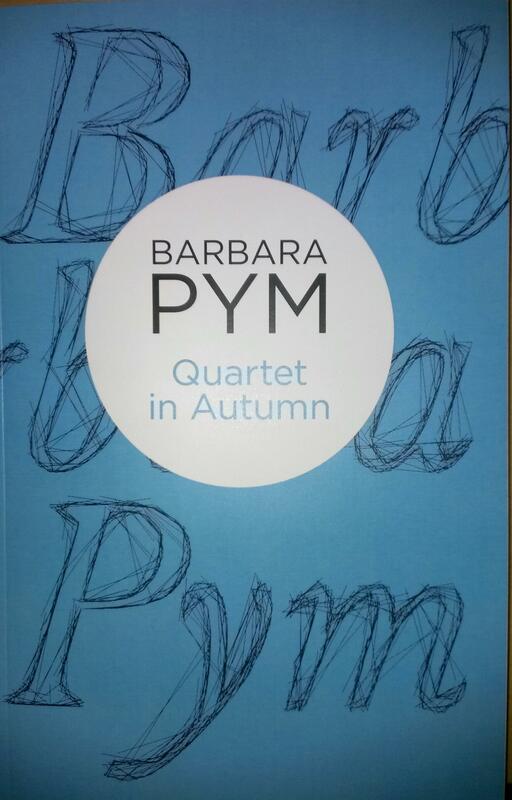 So in that case, this nice print-on-demand copy of Barbara Pym’s “Quartet in Autumn” doesn’t count in terms of books in and is perfectly acceptable. Well, whatever, it’s got a nice understated but well-designed cover and it looks OK to read inside and it was very kind of Pan Macmillan to send it to me – thank you. Although it doesn’t come up in the reading schedule until later in the year, I may well try to squeeze it in before the Barbara Pym Conference in July, so watch this space for a review. 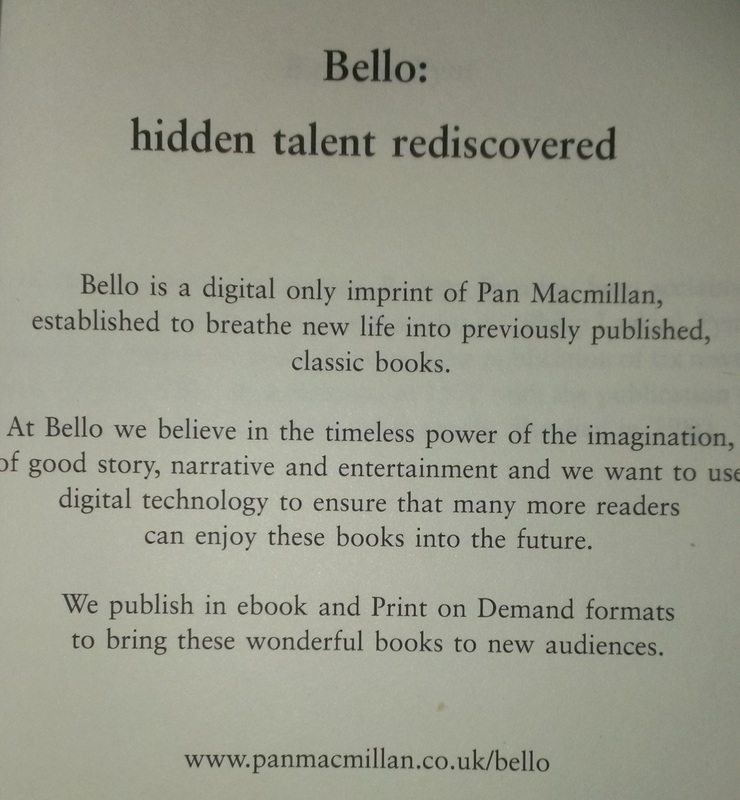 And here’s some information from inside the book about the Bello concept. You can find out more from their website. Two non-fiction books to review today, but rather different from one another, so April’s happy pairings were obviously a fluke. But both good reads in their different ways! Very much NOT “The book of the TV series”, as Marr states in the introduction, this is much more, and different, concentrating more on background, history, precedent and administration than last summer’s telly offering, which featured more of Princess Beatrice in the Queen’s life-size dolls’ house, etc. As reading a book is supposed to be more satisfying than watching a few hours of TV (isn’t it? ), this was how it should be, and the book was fascinating. There is lots of detail about the monarchy in the 20th century and, indeed, its relatives around Europe. This gives an excellent background to both the rituals of the current monarchy and the way the Queen reacts and behaves. It is a little bit hagiographical – but Marr is careful to point out that he observed the Queen closely during her public engagements and could not fail to be impressed. I am by no means a Royalist, but I did find the descriptions of her commitment to her role, shyness at public speaking and care for her people quite moving. I also liked the odd sign of cheek and liveliness most amusing: apparently the Queen and Prince Philip go driving around London in a nondescript car from time to time, still. I read this at the same time as a friend reading it on Kindle, and I think it would have been a shame to read it without the pictures: it’s fairly lavishly illustrated with well- and lesser-known photographs and a set of pictures of the official portraits (including one featuring a corgi which bears a striking resemblance to one of our cats). It’s written with care, in that Marr style with which we’re familiar from both his TV series and his other books: slightly dry and wry and more conversational than one might expect. All of the family scandals are brought out and examined (which does undermine the chronological structure of the book at times) and he’s obviously not a huge fan of some of those associated with the Royal Family. I found the discussions of the various Prime Ministers and what they said about their weekly audiences with the Queen, and the clarification on how exactly Blair overstepped the mark when talking about these in his own autobiography, the most interesting part of what was a wholly interesting and satisfying read. Second in a bunch of books bought at the Book People shop on the local High Street – and I don’t think I’d even been to the dentist on that occasion. This is a dangerous book to read if you’re contemplating extending your half marathon training to see how far you can run (building up gradually) and then considering a marathon. Or a good book. I’m not sure. Harvie had done a few marathons when he decided to join the rather alarming world of Ultra running – running distances longer than the 26.2 mile classic marathon. He sets his sights on the Spartathlon, oddly enough taking place in Greece, but does a lot of interesting races in between, decides fell running is a bit too scary, trains maybe a little too hard and obsessively, worries his wife and worries himself that he’s running away from issues in the family. All of this is set amongst a useful if slightly too well-known to someone who’s read a few long-distance running book) potted history of the marathon and beyond, references to other great books on the topic from Haruki Murakami (“What I Talk About When I Talk About Running“) and Richard Askwith (“Feet in the Clouds”) among others, and some amazing, visceral descriptions of his own long training runs or race attempts. These passages are the stars of the book and really get into the nitty-gritty of what it feels like to be a distance runner. They inspire empathy, wincing and the desire to emulate his trials and achievements – after all, pretty well anybody can train for a marathon and there’s a joy in pushing yourself past your limits (he makes an interesting point about it being fair enough to praise the person who only ever runs one marathon because that is the pinnacle of their physical achievement, but if someone does more than one, they can probably do a bit more – do other runners agree with this?). His descriptions of attempting the Spartathlon are uncomfortable but unforgettable reading. Did he make it to the end? You’ll have to read the book to find out! Oh – and there’s a quotation from Iris Murdoch on page 202, about attention teaching us how to observe things without greedily appropriating them for ourselves”, although this is tantalisingly not referenced. But one for my friend, Pamela, who likes to collect references to IM in what we read!